Ronda Rousey (pictured) winning in the first round is nothing new. The UFC’s reining bantamweight champion had done it in seven of her eight professional fights before meeting Sara McMann at UFC 170. 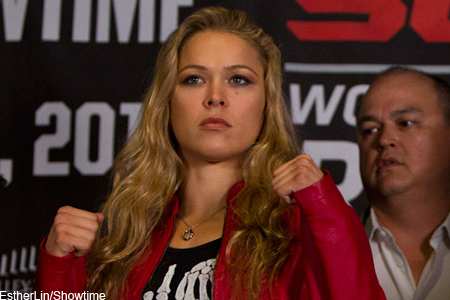 However, what was surprising was how Rousey beat McMann on Saturday. All of Rousey’s eight wins were via her trademark armbar. Against McMann, Rousey opened up her arsenal by finishing things with a knee to the midsection. Sure, we can debate all the livelong day whether referee Herb Dean jumped the gun in stopping the scrap. McMann was clearly disappointed in the perceived premature stoppage, but the former Olympic wrestler was all class in defeat. So, if McMann isn’t complaining, then the rest of the MMA world shouldn’t, either. The official time of the stoppage came at 1:06 in the opening stanza. UFC 170 took place inside Mandalay Bay Events Center in Las Vegas, Nevada.